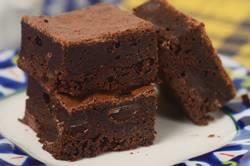 Brownies: Preheat your oven to 350 degrees F (180 degrees C) and place the oven rack in the center of the oven. Line the bottom and sides of an 8 inch (20 cm) square baking pan with foil. Butter the foil. Melt the chocolate and butter in a large heatproof bowl (I use stainless steel), placed over a saucepan of simmering water. Remove from heat and stir (or whisk) in the cocoa powder and sugar. Next, whisk in the vanilla extract and coffee extract (if using). Then, whisk in the eggs, one at a time, beating well after each addition. Finally, stir in the flour, salt, and chocolate chips (if using). Pour into the prepared pan, smoothing the top with the back of a spoon or offset spatula. Bake for about 25 minutes or until a toothpick inserted in the center comes out with a few moist crumbs clinging to it. Remove from oven and let cool on a wire rack. Serve at room temperature or chilled. These Brownies freeze very well.